Okay, if you don’t already know, the Vampire Bestiary: Mountain of the Cannibal God pdf is available at RPGNow HERE for $8.00. 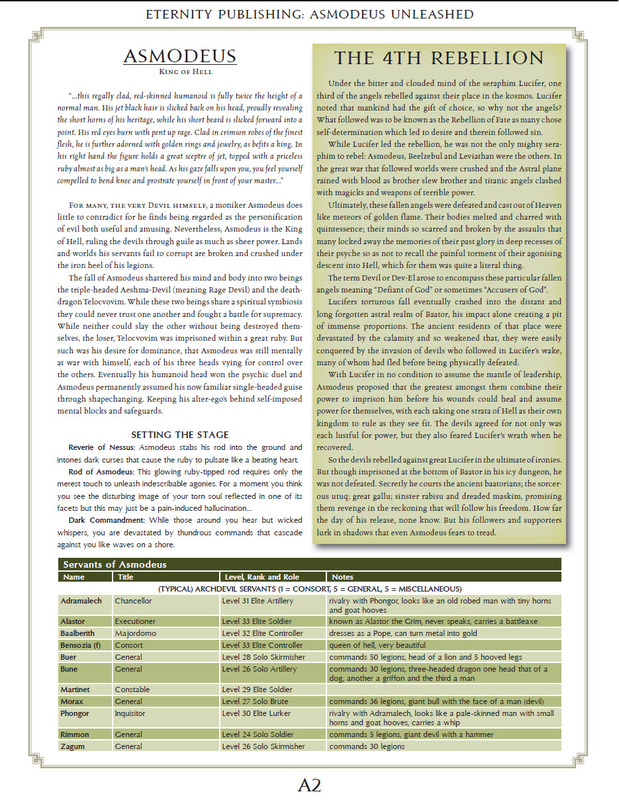 This article details Asmodeus for 4th Edition D&D, in a way its a companion piece to my versions of ORCUS and KRONOS. UPDATED FRIDAY 20th of JULY: I added two more pages, but this is still NOT the full article. I still have Aeshma-Deva to update as well. I’ll try and get that up for next Friday (the 27th). Today’s update adds the Telocvovim entry as well as some creatures he spawns/summons during the encounter – I still want to go back and tweak Telocvovim a bit, I’m not totally happy with him. I also changed the Solo Resilience power of Solos (on both Asmodeus and Telocvovim). Let me know what you think of the change. Of course the devils would themselves be adjusted by rank: Nobility as solo’s, Greater Devils as Elites and Least Devils as Minions. Of course the balancing act you face is therefore when all the devils of a given sin are together. As we can see above the six classifications with two rank variants gives us the ability to seemlessly use Rage Devils for mid-high Paragon Tier AND mid-high Epic Tier, with 4 different choices at each tier. Gaze of Asmodeus: Capable of causing (1) fear, (2) fear + weakness, or (3) chill (slow) different effects. Ruby Rod of Asmodeus: Acted as a rod of absorption, Delivered a cause serious wounds to anyone touched by its tip and can also shoot forth a cone of frost, jet of acid or bolt of lightning (as per the appropriate dragon breath). Spell-like Abilities: The most pertinent of these abilities seem to be the large number of charm type capabilities, shapechange, wall of fire/ice and his ability to fulfill another’s wish (at will!) – which was only allowed to be granted to mortals of their own free will. Summoning: Could always summon 2 lesser or 1 greater devil. Asmodeus was never detailed in 2nd Edition and in fact was never even named until about a dozen years after the release of 2nd Edition because of the idiocy of the Angry Mothers From Heck and their ill-conceived crusade against the game. When Asmodeus did finally get a mention it was to suggest that he was a fallen angel overgod whose true form was a great serpent/dragon whose fall created the Nine Hells. The humanoid form was just some sort of Avatar or Aspect of this true being. Asmodeus shows up in two books, firstly the Book of Vile Darkness and secondly the Fiendish Codex: Tyrants of the Nine Hells. Aura of Submission: This basically turned his charm like spell abilities into a single aura. Regeneration: Asmodeus gains regeneration 13 (weird number to pick) which is negated by holy damage or weapons. Ruby Rod of Asmodeus: The rod actually gains some new powers. Firstly the ability to render someone who tries to wield the rod helpless. Secondly the Reverie of Nessus which is a bit like a donut aura with anti-magic on the outside and a wall of force on the inside plus Asmodeus is automatically purged of all negative spells and conditions affecting him and fully healed. Asmodeus has not yet been detailed in 4th Edition, however, he has become a Greater God and as such must be considered at least Level 37 (Solo Monster) by the game’s mechanics. Okay, my first thoughts regarding Asmodeus are that he will be useless if I detail him at Level 37 or above, but at the same time if I don’t make him that powerful it won’t really be the “real” Asmodeus and thus people will feel cheated. So by way of a compromise I have decided to make him a Level 38 solo monster but ‘cheat’ by using the super-solo rules and drop him down 5 levels to Level 33 and give him two (solo) stat-blocks. I decided to use his occult appearance as a second (true) form. What isn’t depicted in the illustration is that he is meant to carry a lance/standard in this form. In the famous de Plancy image he is also seen riding a dragon. This beast is named Telocvovim an Infernal Dragon known as “the Death Dragon”. It occured to me that what if his rod (or the giant ruby atop the rod) was actually this dragon’s imprisoned form (hence the breath weapon tie-in) and that part way through the battle the rod turns into Telocvovim. It also occured to me that the three-headed Asmodeus in the de Plancy illustration, coupled by the dragon may well be two halves (or more specifically three quarters plus one quarter) of a fallen Seraphim (or Balseraph). In effect, when he was cast down from heaven his fall wracked his body, splitting him into “The Dragon” and the “Beast”. Phase I: Asmodeus (humanoid form) wielding rod. This would be the mid-point of the battle. Once Asmodeus’ humanoid form is destroyed, he adopts his more monstrous form. Phase IV: Asmodeus (monstrous form) + Telocvovim. Phase V: Rage Incarnate. Gravely wounded, Asmodeus terrible form unleashes a wave of rage that automatically infects all combatants causing them to attack random targets (even their own allies) until saved against. Phase VI: The fight to the finish. 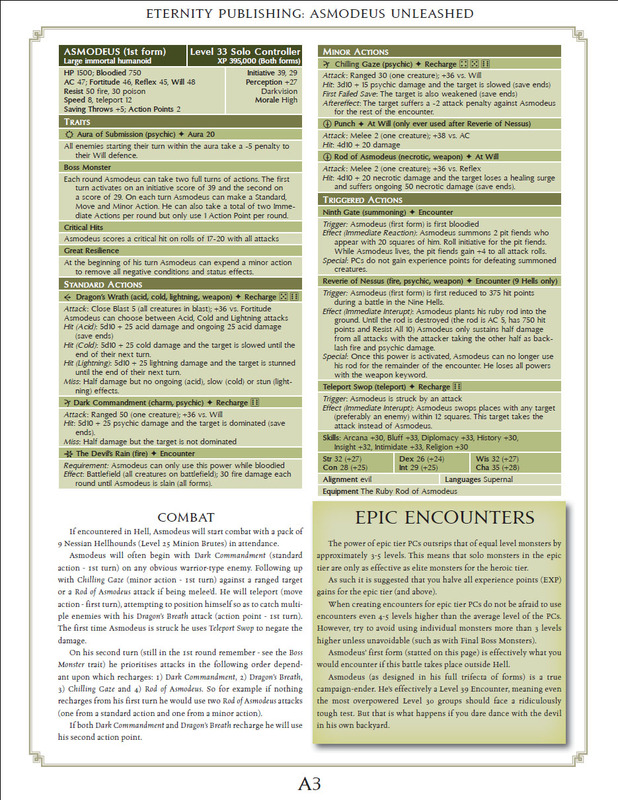 In 4th Edition, the PCs gain an unseen 18.3% power per level boost over and above monster levels. 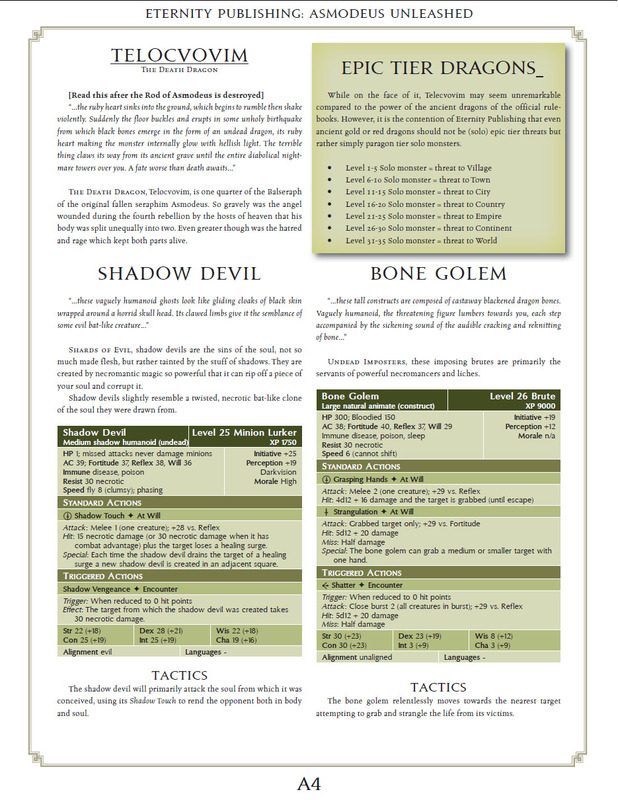 The result of this is that every 6 levels PCs effectively gain one full level over the opposition. Thus at Level 30, PCs are effectively Level 35 in terms of challenging monsters, not Level 30. Use (for your standard) Encounters 18.3% higher level than the PCs average level. (e.g. For a Level 23 party you would use Level 27 as the average Encounter Level. Replace Minions with Standard monsters, Standard monsters with Elites, replace Elites with Solo’s and replace Solo’s with Super-solo’s. Additionally I’d also suggest that you divide XP by half during Epic Tier encounters. But I’ll leave that for DMs to decide themselves. Asmodeus here is a Level 33-Super-Solo monster. That means he should be a typical challenge for a party of 5 PCs averaging (a hypothetical) Level 33. It also means he would be a Difficult (as in 50% chance they will lose) challenge for a party of 5 PCs averaging Level 29. Hope you like it. As ever, click on the pages below for the larger versions. Badass! I especially like how you incorporated the idea of the Seraphim and the Balseraph into this, and how this is the first described example of a Balseraph. One question though… if Asmodeus is a Balseraph, what is Lucifer? Metatron’s predecessor (kinda makes sense as Metatron was made from Enoch and thus probably postdates the Fall), or simply another Balseraph? Lucifer is also a Balseraph, just slightly more powerful. Metatron was a Qodeshim (which is the step above Seraphim, although I have found many above Qodeshim 😉 ). Lucifer was the leader of the 4th Rebellion (rebelling against Metatron). Am I missing something or won’t this be more like a 3 solo-fight? Humanoid/Humanoid+dragon/Aeshma-Deva? Asmodeus: I like the traits,though I think great resilience might be too strong (maybe a standatd action). I like that the standard actions are all recharge/limited – hit’em hard! The Devil’s rain seem a little much at this point to me (he already has a pretty tough aura), I would save it for a latter stage of the fight. I like the melee attacks as minor actions ( I do this alot as well); however, chilling gaze’s -2 penalty for the encounter seems harsh (since it is almost an autohit with the aura of submission), I would end on a save or end of turn. Trigger actions OK, but seem a little light, but with all his other actions maybe they aren’t needed. Telocvovim: Same comment on the traits, though I don’t understand what happens when it is reduced to 0 hp and the Aesham-deva is not at 0 yet. 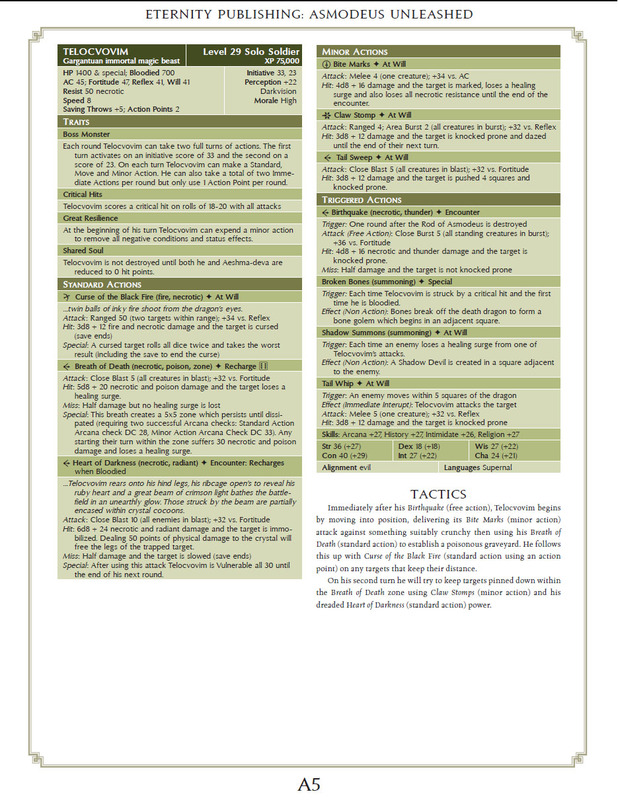 I like the cursed black fire – nice used of the 5e disadvantage mechanic. Heart of darkness is interesting, though I might go close blast 20. No issues with the minor or trigger actions. One issue I have seen is the massive amount of damage teh PCs can do from multiple free actions. I usually give my gods some method to combat the rediculous stacking damage PCs can do. Has this been a problem for you? I think the super-solo rules may take care of it because the monster will last longer anyway, but I was curious if you had other solutions. just back from London mate. 2. Solo Resilience will probably be tweaked. I’m thinking that its a Standard Action for ALL conditions or a Minor Action for one. For Elite Resilience I might change that to a Standard Action for one condition. 3. Devil’s Rain is powerful. I’m wondering though if some DMs may want to use the Asmodeus humanoid form on his own though. It is very powerful though. But again, this is a final test for Level 30 characters and I know how powerful Level 30 characters can be. 5. 5E Disadvantage – I already had Curse (take the worst of two dice rolls) as a mechanic in 4E for several years. 6. Heart of Darkness was a power that never really came together outside of my mind. It probably needs a rethink – I’m convinced there is a cooler version trying to escape from that text. 7a: When your PCs deal damage to the BBEG, they take backlash damage in return. …I have a temporal monster which gains a standard action whenever PCs use an Action Point for instance. Welcome back and did you get to the games at all? 1. I thought so, I just wanted clarification. 2. That looks good to me. 3. Ya, I could see Devil’s Rain used on just the humanoid version. Personally I have started to move away from constant damage auras (which this basically is). I have run a few high-epic (lvl 30 pcs) encounters now and I found I was always forgetting to remind the PCs to take the damage! Thus, I just dropped them and upped the attack damage. 4. Do they share a hp pool then? What happens when on is reduced to 0? Does nothing change? Does it fall for a turn then get back up with a surge amount of HP? I still feel like something is missing (or I am missing something). 5. I thought you had – but I couldn’t remember for sure. 6. How about a failed save mechanic? First failed – restrained (100 hit points to free). Secound failed – stunned (200 hit points to free). Not exactly that, but you get the idea. 7. I like the extra hp the super solos provide because you don’t have to nerf the PCs. I agree, they should be good for most epic groups. 7c – I have also used a trigger, the BBEG uses a free action (interrupt or reaction) when hit by the same PC more then x (1 or 2) times in the same round. This action can do damage or paralyze (stun, daze, push, etc.) the traget until the start of their next turn. Thus, it doesn’t take away actions, but prevents massive stacking. 8. I look forward to it. I just noticed that you used the X5 method for the hit points (instead of the updated X4 method). Was this on purpose or just a mistake. Just curious ablout your thoughts. Personally I have started doubling the elite hit points for solos, thus keeping the variation between roles. I make up for the HP difference with the design of other powers or the encounter itself. Yes I got to see the Olympic Wrestling. Great stuff…and I played lots of RPGs, including Pathfinder Beginner Box, which was actually pretty good (much better than Pathfinder). Devil’s Rain you could say is a Hell/Nessus only Terrain effect that comes into play when Asmodeus loses his cool. As regards the combined hp tallies. My thinking is that it will be the final twist to that fight, PCs often like to unload attacks on one monster (particularly the BBEG) to get rid of them quick and this will be a bit of a shock. I’m not a big fan of the “Take some hp damage to overcome effects”. I prefer use an action to ‘shake-off’ conditions. As regards the x4 solo hit points I think I do sometimes lapse into x5. My mistake. Just out of curioisty, it this ever going to be finished? I really want to run Asmodeus as the final boss for my campaign I’m running but I want to wait and see if you are going to finish his second form. I’m a huge fan of your work so far, and I love reading your blog. I’ll see what I can rustle up this weekend. Maybe I can get it completed. I appreciate the support. I apologise for not having updated more these past few months. My fault entirely. But hopefully I can sort a few things out and get back to semi-regular updates and releases. I’ve got the Aeshma Deva stat-block half finished. For some reason I seem to have misplaced my notes on this one. If I can’t find them by tomorrow I’ll just try and figure out something cool in their place. I am sure I had at least two really good ideas for Aeshma Deva and for the life of me cannot remember what they were…I should have written them down…then written them down somewhere else where I had written them down. Either way he’s extremely tough with triple actions and a Level 33 Super-solo (which I may up to Level 34). He’s armed with the Lance of Blood (which is also a flag/standard), has an Aura of Wrath, can open a Mouth of Hell and I have a few more ideas like his wounds spew tiny Abominations (Worms of Wrath called Awim) then he eats them back in to regain the hit points from any damage they’ve done. So the PCs would need to avoid and/or kill all these before he devours them. Cool (if kind of complex). Oh, you could also give him a power “Tears of Heaven’s Fallen” that causes an evil rainstorm that inflicts acid + necrotic damage in a huge radius. Got this half finished, might have it done and online for tonight, worst case scenario tomorrow. Couldn’t find my notes so just went back and re-brainstormed the whole thing. The current build is probably TOO powerful, so I am looking for a few ways to limit him a tad (or at least spread his attacks out a bit). So I have all the ‘pieces’ in place, I’m just trying to arrange them in the best order. I love this. Cant wait for it to be finished. Do you mind if I translate this over to a 3.5 campaign of mine? Heh heh, a multi-form 4th style boss in a 3e game. I cant wait. By all means convert to 3.5E as you see fit (assuming its only for personal use and not done in the course of trade naturally). The write-up on Aeshma-Deva is finished (though I’ll likely give it a few tweaks), But I am still not happy with regards some of the powers. So I’ll sit on it and mull things over tonight.and if I can’t fix it within 24 hours I’ll just post it regardless anyway. The Awim worms stat-block I have also included. Initially these were going to be one of my new Abominations, a big Mega-sized Dune style worm that is the Abomination of Wrath and has smaller versions of itself inside itself constantly biting and keeping it angry, and they have smaller worms inside them and so on and so forth. The version I have included here are just the ‘small-sized’ worms, epic tier minions, not the Mega-size one. They crawl out of Aeshma-Deva’s wounds and try to attack (and control) his enemies. Wow, Aeshma-Deva sounds very cool, and so does the Awim. He does sound very powerful. I have fixed a few things and toned him down considerably. Really STILL not happy with the whole entry but I’ve dragged my heels long enough on posting it up. So hopefully should have that online within 30 minutes. I didn’t see it at first since I was refreshing this page: you might want to put a link at the top of this page, or even edit the A-D stat block into here as well as in its own article. I’ll do both suggestions when I update the article in a day or two. Not that keen on everyone seeing the current incarnation of the Aeshma-Deva. But I know now what fixes I’ll be making. Working tonight and then off for a few days so I should have the time to update it and make the necessary changes. Just to be sure you cover it. 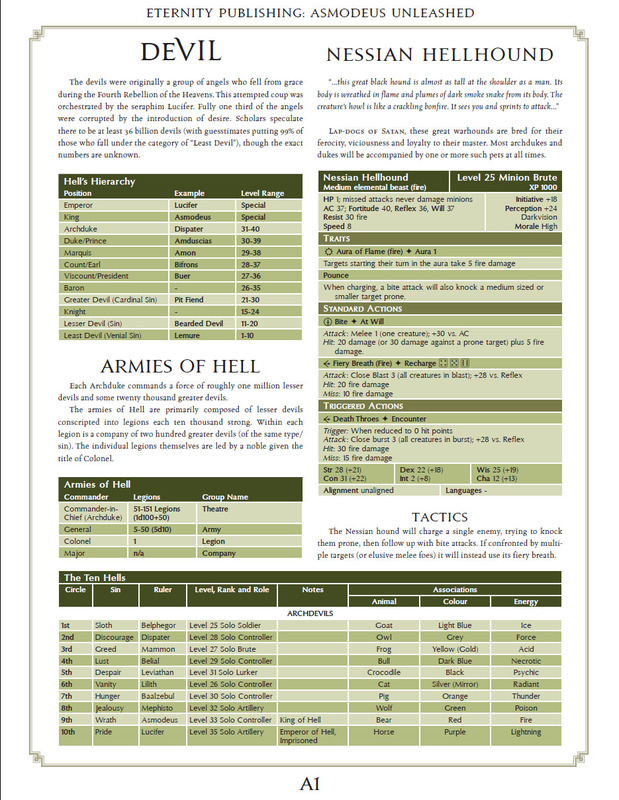 Asmodeus avatar powers are detailed at page 51 of Guide to Hell, a sourcebook dated year 1999. He still has a remarkable presence, the rod and several immunities. You know I don’t think I actually own that sourcebook. Probably one of the very few I don’t. That said, I think I already have all those abilities covered from elsewhere. Plus I am happy enough with how Asmodeus himself turned out.